The new technology is called a medium voltage fast charger (MVFC). Conventional, 50 kilowatt (kW) state-of-the-art chargers include a distribution transformer, which weighs 1000 kilograms, and a separate fast charger unit, which weighs 200 to 600 kg. To support the weight, this transformer-and-charger system usually needs to be installed on a concrete slab. The transformer takes power from a utility medium-voltage line line and steps down the voltage to 480 V so that it that can be used by the fast charger. The fast charger takes the AC voltage and converts it to DC voltage that is compatible with the electric vehicle’s battery. “Our 50-kW MVFC weighs only around 100 kilograms and can be wall- or pole-mounted,” says Srdjan Lukic, an associate professor of electrical engineering at NC State and one of the researchers who developed the technology. “The MVFC does the work of both the transformer and the fast charger, taking power directly from a medium-voltage utility line and converting it for use in an electric vehicle battery. “This new approach offers four times more power from the same system footprint, reducing the system installation costs at the same time,” says Srdjan Srdic, a research professor at NC State who also worked on developing the technology. The researchers were able to make the technology so much smaller, in part, because they used wide bandgap semiconductor devices. This also made the technology more energy efficient. At present, the best transformer-and-charger stations are reported as having an efficiency of up to 93 percent, meaning that at least 7 percent of the power is lost to heat during the charging process. In testing, the prototype MVFC has an efficiency of at least 97.5 percent, meaning an additional 4.5 percent of the power is used to charge the vehicle, rather than being wasted as heat. This reduces operating costs, increasing revenue without increasing the cost to consumers. “In other words, we were able to cut the wasted energy by more than 60 percent,” Srdic says. Reporters can request a demonstration of the prototype MVFC. The current version of the MVFC charges at the same speed as existing charging stations. That’s because this iteration of the MVFC was designed to operate at 50 kW, which is the power level of a typical fast charger. However, the research team is in the process of building a next generation MVFC that handles much higher power, capable of charging more vehicles and charging them more quickly. “We are building five charging nodes into the prototype, but there could be twice as many or more,” Lukic says. The multi-port MVFC will have a rating capacity of one megawatt, with each charging node capable of providing up to 350 kW of power. 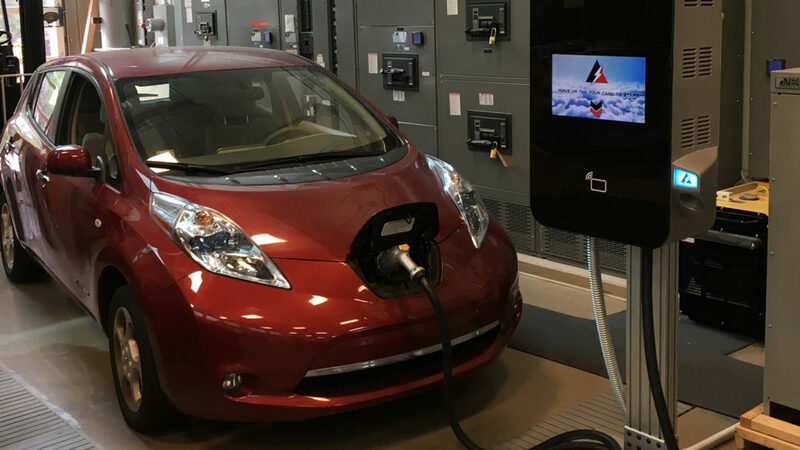 The upgrade from 50 kW to 350 kW means that a vehicle can be charged up to seven times faster. “We’re currently looking for industry partners to help us move from our fully functional prototypes to the marketplace,” Lukic says. The development of the existing MVFC prototype was done with support from the PowerAmerica Institute, a public-private research initiative housed at NC State and funded by DOE’s Office of Energy Efficiency and Renewable Energy (EERE). The development of the multi-vehicle MVFC prototype is being funded by EERE. FREEDM was created with support from the National Science Foundation.